The Flower Mound Town Council on Tuesday night approved the Master Plan Amendment (MPA) and rezoning request for the Lakeside Village development with a unanimous vote. As with the Lakeside DFW development to its north, the 38.5-acre tract includes a mix of retail, restaurants, hotels, villas, residential and office towers, plus amenities. This final piece of the Lakeside DFW project will continue the mixed-use (MU) concept and, upon completion, will add approximately $1.2 billion in taxable value, which translates into more than $4 million in revenue for the Town of Flower Mound. After listened for six-hours to an update by Assistant Town Manager Tommy Dalton, a presentation by Jimmy Archie, managing director for developer Realty Capital Management(RCM), plus an overflowing council chamber of public speakers, the council members put their trust in the concept originally envisioned by property owner Peter Pauls Stewart back in 1973 while on a dove hunt. “Balancing our tax base and adding amenities residents want has always been a long-term goal of this council and, with tonight’s vote, we were able to achieve both in a project that will make a positive impact on our town,” said Flower Mound Mayor Tom Hayden. Multiple public speakers requested the council members take more time to consider taking action; some said they were just learning about the project. Realistically, they were actually asking for time to allow them to educate themselves; town staff and officials have been considering and setting policy on the peninsula acreage for the past 32 years. In 1986, (PD-39) zoning was passed that allowed for unlimited Campus Commercial uses without height restrictions by the town, except the FAA 40-stories limit and a required Comprehensive Site Plan approval. It was “grandfathered” zoning included in the 2001 Master Plan. In the 1999 Vision, there were seven tower buildings depicted, with no residential units, open-space or trails. In 2007, a depiction of the nine-acre Hines tract [the property recently bought by developer Realty Capital Management] showed a hotel and 18-story condo tower. This property was still under the original (PD-39) zoning and its assimilation into Lakeside Village was the reason for the current MPA and rezoning requests. In 2012, the “village” mixed-use project was recommended for the Master Plan to include: class A and B office space; upscale dining and shopping; residential alternatives; and, lakefront access. The MU building heights were: MU-TEN (2) 18-stories, MU-TEN (1) 25-stories; and, MU-C3 also 25-stories, but residential units weren’t– and still aren’t– allowed in the micro-zone. Until June 19, 2017, the “Stewart’s peninsula property” was closed to the public behind a chained and locked gate. It was on that day that Realty Capital opened the gate and held a public open house to present its vision for the property. An Aug. 24, 2017, an informational meeting about the proposed project targeted to existing Lakeside DFW homeowners was followed with a marathon Oct. 19 Town Council work session; the developer’s third public discussion about the prime real estate. In 2018, there have been three public hearings– the March 26 Planning and Zoning meeting, which tabled the project until an April 4 joint work session with Town Council, P&Z and the public could be held. Then, on April 9 P&Z Commissioners voted to recommend approval for the project to the Town Council. Deputy Mayor Pro Tem Kevin Bryant shared that the U.S. 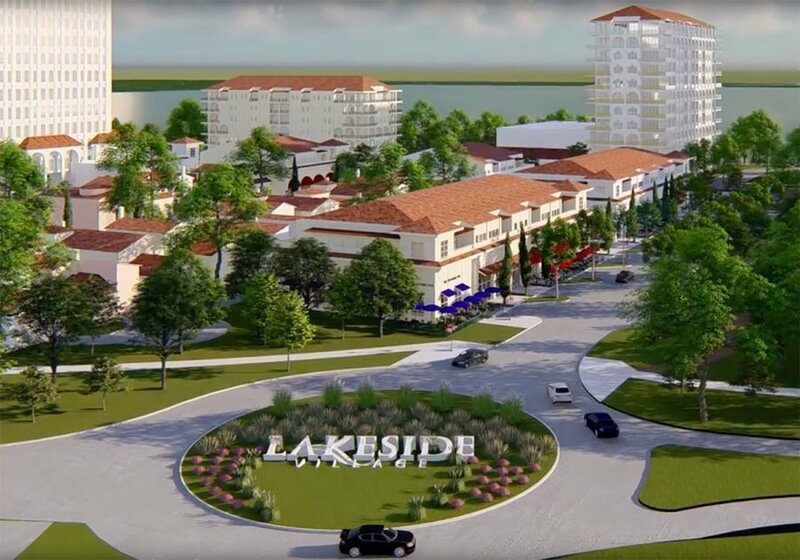 Corps of Engineers– which controls the Lake Grapevine shoreline– has approved the building of a pier for Lakeside Village to facilitate a water taxi, proposed by The Gaylord in Grapevine. “Unlocking 8,000-acres of open space [is huge],” said Archie of the project. Further discussion included making the Boardwalk and access areas ADA (Americans with Disabilities Act) compliant. He also explained why the current commercial-space numbers appear to be lower than originally proposed. “Originally, hotel units were part of the maximum commercial to be built, but now hotels are counted separately,” said Archie. Asked about the reduced outdoor Sunset Green Amphitheater size, Council member Bryan Webb said it was a council request, due to the Large River Walk Amphitheatre and a desire to keep more of the tree canopy. The most recent addition to Lakeside Village is the possible inclusion of a Fine Arts/Cultural Center in the vicinity of the Community Green-hotel-restaurant tip of the peninsula. The possible “hitch in the git-along” is the funding for the two-story center, which is dependent on the town. It prompted discussion of setting-up a Tax Increment Reinvestment Zone (TIRZ), such as the existing TIRZ along the northern FM 2499 corridor, which was used to fund the town’s new Town Hall, as well as other buildings in the center of town. When council member Bryan Webb had proposed the idea of including the center– which was listed on the TIRZ 1 project list– he added that TIRZ funds must be used to benefits the whole town, not just residents of Lakeside Village. “Any time a developer agrees to hold land back, it’s a risk,” said Archie about “bookmarking” a place without a commitment from the town. “It would take 12-months to set up a TIRZ for a Fine Arts facility,” said Town Manager Jimmy Stathatos. Council members agreed to make a decision to commit or not by April 18, 2019 and set a deadline to start construction by Dec. 31, 2022.